There was a time in my life that I would wake up in the morning, roll over, grab my phone, and immediately check Instagram. It finally occurred to me that, before even taking in my first deep breath of the day, I was checking a social media platform to see how many people liked me, how many people followed me, or if people liked me as much or as fast as they liked other people. I needed validation that what I put out in the social media space mattered. The sad reality is that most of the time, it would make me feel anxious, frustrated and defeated. As a digital marketer, publicist and blogger, I knew metrics and social proof mattered. I knew that stats and feedback were important to my overall growth. But what I started making up and telling myself was that if I wasn’t getting the same, if not more, followers, likes and engagement every day as the day before, I wasn’t good at my job, I wasn’t performing like I ought to be, I was losing. I mean, what a pretty pathetic way to start a day! Perhaps you’ve been down this road as well? I wanted to share this with you to show how this can affect how you see yourself, therefore, how you sell yourself on social media. I quickly realized that the more and more I consumed, the less and less I truly created from an authentic space. I started to focus more on my purpose and service, focusing less on my own insecurities and issues with social media admiration and unhealthy obsessions with social media metrics. As passionate as I am about social media and how much it can bless our business and creativity, I know it’s easy to become addicted to the affirmations, follows, and likes. What I realized is how sick this morning routine had become. I needed to start creating something BEFORE I consumed anything on social media. I also started overlooking the following/liking stats altogether. The less of a focus I gave it, the more I realized how little is really mattered in my overall growth and profitability. I quickly realized that we all seem to fall within a sweet spot range of social engagement. All and all – we have a good idea of what our “range” is. Embracing my range as a target mark for growth instead of beating myself up for not hitting a specific number alleviated so much stress, and actually helped me come from a place of service with my social media, which led to a better relationships with brands, my audience, and that naturally helped me “sell” myself better. My business continues to grow now more than ever because I stopped putting so much weight in the total amount of followers, likes or comments I receive on a daily basis. As human beings we all love affirmations. We love to be told that we matter, to know our voice is heard and that we are liked and seen as talented. You don’t have to be the best or biggest influencer in the world to still have an extremely successful career as an influencer. If you want a simple strategy on how to start selling yourself today, the right way, then subscribe below. The free worksheet will be sent straight to your inbox. Also, I would love to hear from you in the comments below. Is selling yourself the right way something you struggle with? Do you find yourself obsessing over stats and popularity instead of building a foundation of real authentic connection? Let us know your thoughts! 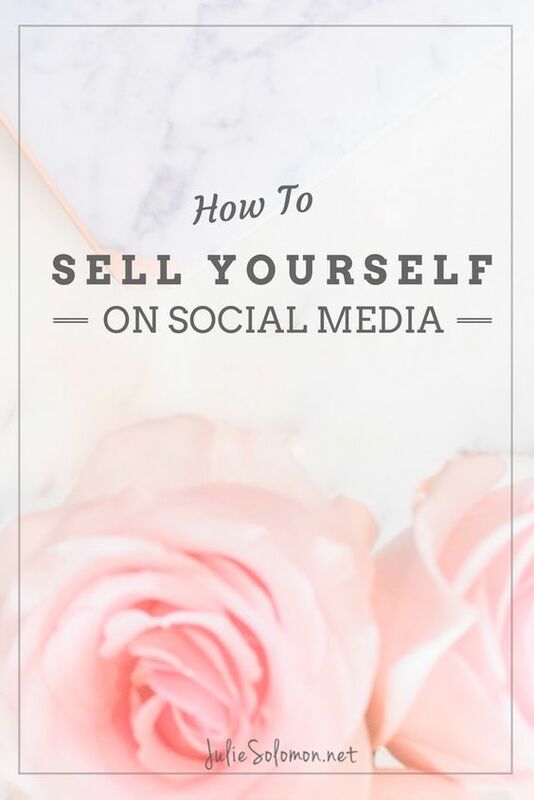 What are ways you sell yourself on social media? What have you found that works well, and what have you found that doesn't? Any advice to share with us? Please leave your comments and thoughts below by clicking the "comment" button at the bottom.